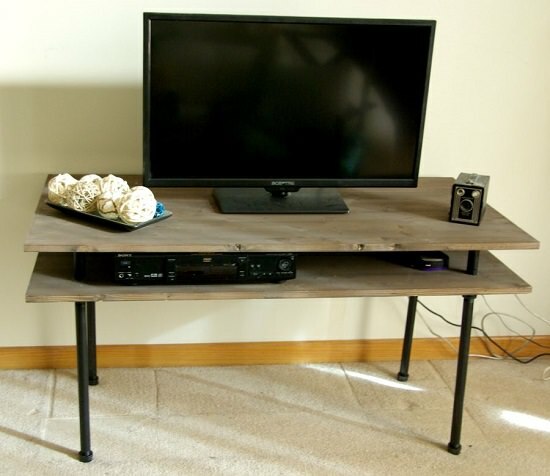 DIY TV stand can be a good option if you want to save some bucks without compromising on looks. 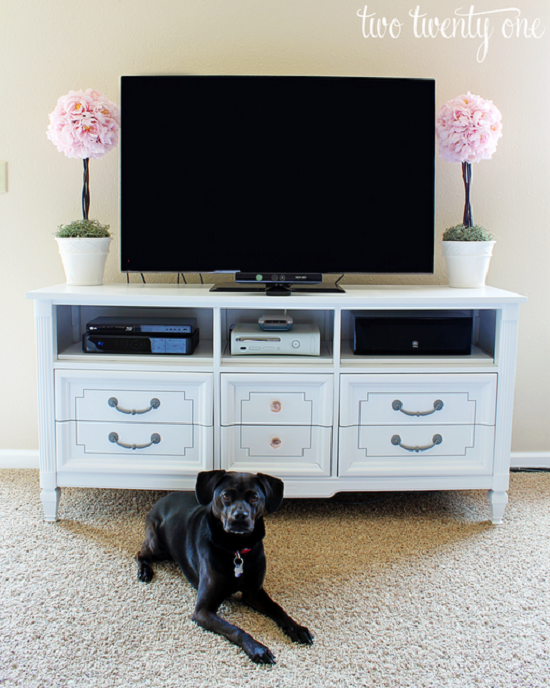 Check out these DIY TV stand ideas and get inspired! 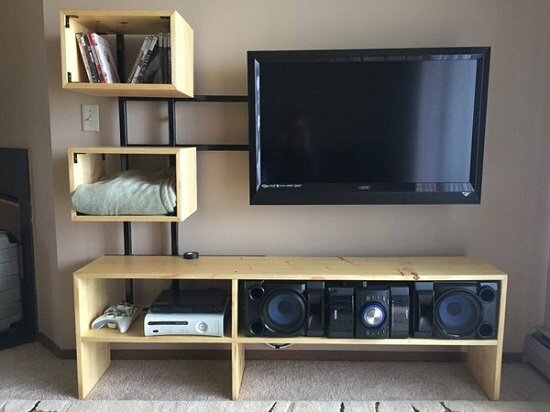 If you’re worried about consoles taking up too much space in your tiny apartment, consider using pallet to create a minimalistic TV stand like this one. Here‘s the DIY! 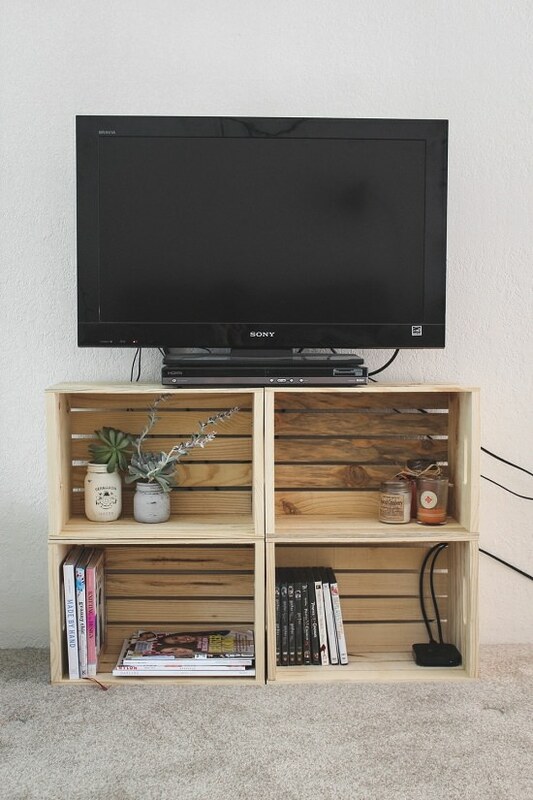 Here’s a DIY media center that is just the perfect size to fit a lonely corner, while giving you ample storage space for your DVDs and stuff. 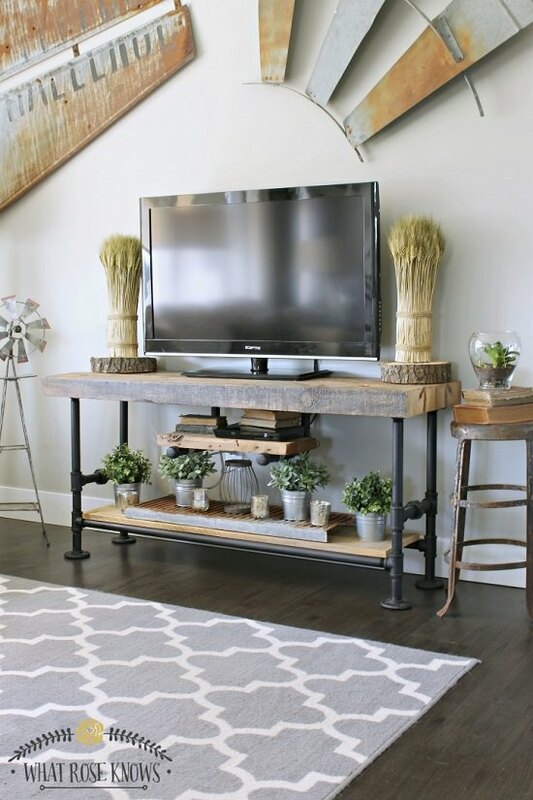 Create a fresh, countryside feel to your urban space with an X-Leg TV stand. Visit here for the instructions. Door brackets and latches are the real showstoppers of this vintage-style media cabinet featuring ample shelving units and storage space. Make your own here with this tutorial. This sturdy plywood cabinet hosts open and closed shelving both so you won’t need a separate shelf. Check out this post for details. 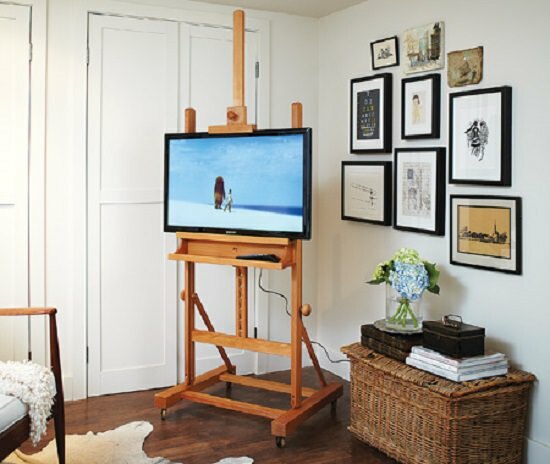 If bulky TV stands are not quite your thing, consider fashioning an easel out of the pallet. And don’t forget to put in wheels for a hassle-free moving experience. Here’s the tutorial. No one would guess that this is dresser at first sight. 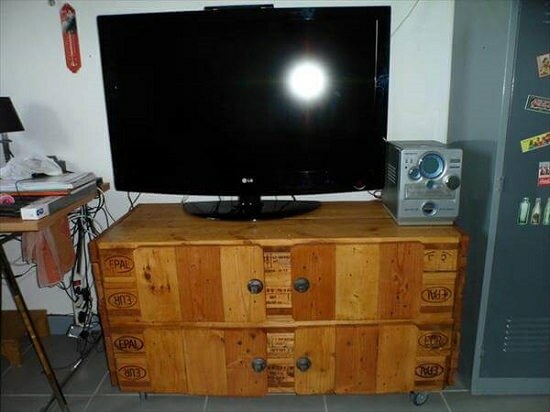 Plus, it’s a great way to reuse old furniture. Get the details here. Using black pipes for legs creates contrast with the wooden sideboard, making the whole arrangement look polished and nothing like handmade stuff. Click here to know more. 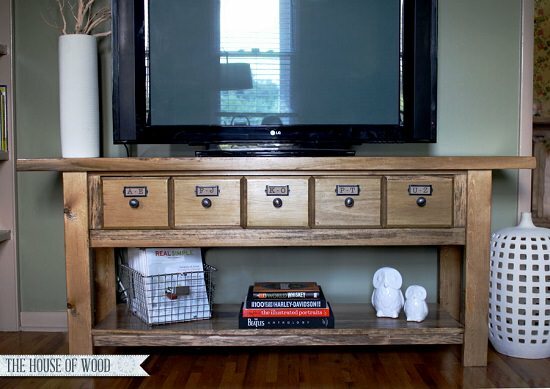 This multi-arrayed console makes good use of available space and hides cordage from plain sight. Get the guidance from Instructables. A space-saving spin on the classic console, this easel TV stand comes with wheels and a timeless look for prolonged use. Make your own with these steps. If you want a cabinet that doubles as a privacy screen, consider integrating cubbies to your ordinary cabinet as this DIYer did. 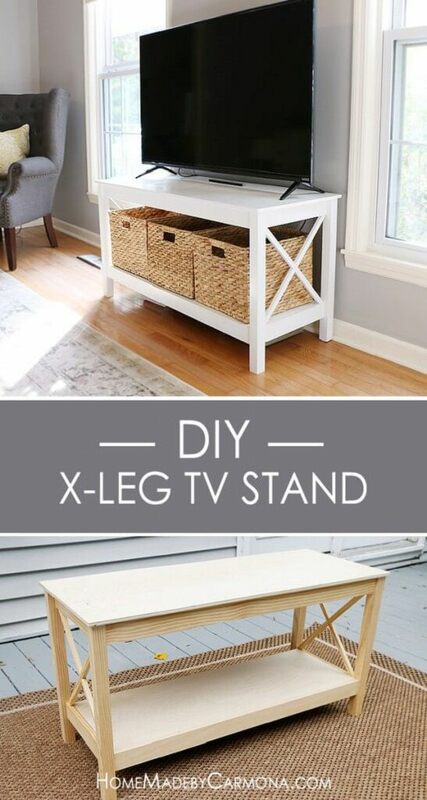 If you are in search of a costs effective way to make a TV stand homedit has something for you. Don’t throw away your empty wine crates yet. Drill them together to create this multi-unit cabinet that is perfect for displaying your books and DVD collection. This no-cost cabinet here uses home scraps like pallet and drawer knobs as its starting materials. The result is mesmerizing! This contemporary-style media wall unit is a hit with modern homeowners as it’s easy to create using recycled wood. Find complete instructions here. Rounding off the corners gives this wooden cabinet a homely feel while helping it fit within the existing space. We got inspired by this post. Who knew that an old Carpenter’s chest could work just as well as a modern entertainment center, complete with cubbies and frames. Check this DIY for the tutorial. A fresh respite from those ugly, archaic cabinets, this one by jenwoodhouse looks straight out of the pages of a lifestyle magazine. 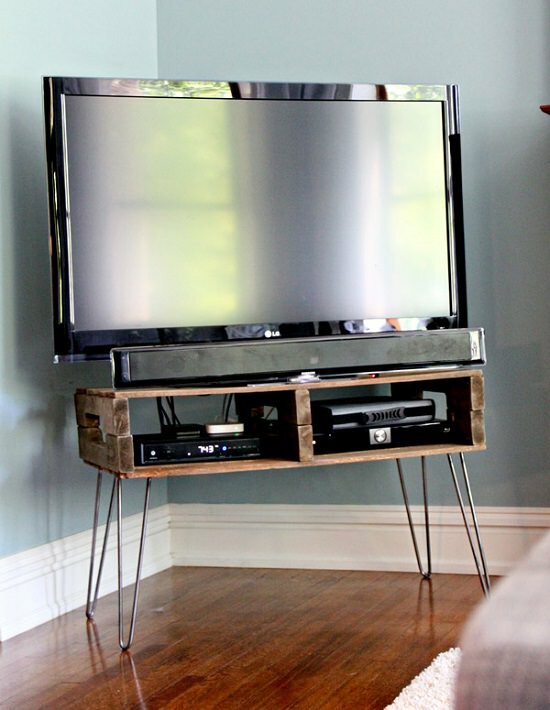 Found these DIY TV stand ideas helpful? Drop your comments below if you have any questions!